Are you looking for tips and resources to save money on board games? We know how fun it is to find new tabletop games to play and add to our board game collection, but the cost of games can really add up. However, growing your board game collection doesn't have to break the bank. 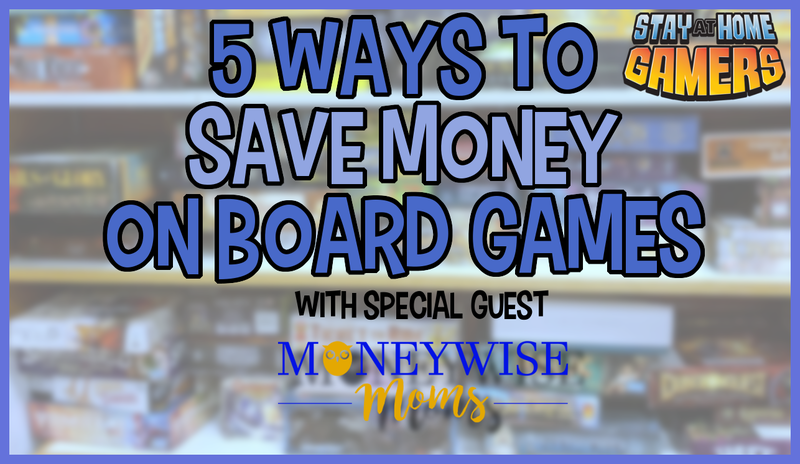 We invited a special guest to share her money saving tips and tricks when shopping for board games. In this video, ways to save money on gaming includes sharing games with friends, attending free to play game days in your community, buying used games, including gaming in your family budget, and ways to utilize a wish list to purchase and receive games for special occasions. Watch the video for more details on these tips or read the transcript below. Darcy: Today we have a special guest. We have Gina from Moneywise Moms and she is going help us learn how to save money on board games while building our collection. Darcy: So, Gina tell us a little about you. Gina: So I have a teenager and two tweens so we have kids a little bit older than you do, Darcy, so we have a lot of games and a lot of experience with this. As a thrifty person, it can be an expensive hobby but it doesn't have to be. Darcy: Yeah, so I would love to know, well first of all, do you have a number of how many games you guys have? Gina: Not at the moment. The last time we culled down to a hundred was a couple of years ago and ever since then I'd say we've changed how often we buy and I'll share a tip for that because now we do a one in, one out for space reasons. Also because my kids are older now, we've actually gone ahead and gotten rid of a lot of the games that they had outgrown that we held onto for a long time. So I actually don't know; I should've counted but, yeah, that's where we are. Gina: One of the tips I was gonna share with you is in terms of collecting, I think that it's really easy when you start a collection to focus more on the collecting than the playing of the games and that's something that over the years we've been playing, I feel like we've definitely changed the way we look at it. So when we're purchasing games we're really looking at playability and longevity. So is it worth what we're spending? Gina: Right, well it's kind of like if you've ever done crafting. I know I can be one of those people that collects and collects supplies but you're never actually crafting or making anything. Gina: That's not really what the hobby is and so I think it's pretty easy with this particular one to get into collecting and there's a lot of games that have lots of expansions and you want to have lots of them. Gina: One of my first tips would be to share. If you are friends with anybody who are gamers and like we have a couple families that we game with regularly, we actually consult each other before we make purchases, especially around the holidays and birthdays because there's no reason to own all of them. For example, we have the original Ticket to Ride from way back when and maybe four of the extra maps and you know there are many, many more than that. And the family that we game with all the time, they have at least four or five of them, as well, so if we really wanted one of those rather than buy it we would just borrow it. Gina: So borrowing is a great way to save money. If you hope to make other friends that are gamers, I know in my neighborhood it has come up just at like the pool and stuff and when you find out other people who play the kinds of strategy games that you like – you'd be surprised. There's a lot more people out there who just don't realize that you're also into those weird strategy games. So find out who those people are because they probably have different games than you have and then you can share back and forth. So that's one big way to save money – to share with other people who are also gamers. Darcy: And it's great too because not only can you borrow the games so that you can play it without owning it, you can also just schedule game nights with them and hang out and play. board games where I live here in northern Virginia, a lot of them have free play days or sometimes they want you to buy a snack or something like that but they have lots and lots of time where you can go in, even the whole family can go in, and sit down at the card tables and play the games. So that is a good way to try some games out for free before you go ahead and invest in them and that's something that we've done over the years. We've had like snow days where it's still okay to drive and I'll just take all the kids and we'll go there all day. Which is awesome because we're not paying for anything except, you want to help support those businesses, of course and we do end up spending plenty of money there, trust me, we like to support our local game store but there are opportunities where that might not cost you any money and if you do have the money to do it, there's also conventions and other places where there may be big board gamers. It's just a nice place to try some games before you go ahead and put the money in. The other thing that's popped up, I don't know if you have this where you live, a lot of the libraries lately are having game days that are like nine to five on a weekend day and everybody just brings their games. So again, it's a way to meet some new people and try some new games for free. Darcy: I haven't noticed ours doing that yet but I've honestly been thinking about starting that. Like trying to reach out to the library and coordinating an event like that so that we can have people get together and play. Gina: That's a great thing to, like in our neighborhood we have a big pool here and there's a community room and so that's something that we've done. Because you're listening for those key words that they're not sort of playing those standard boring games. You want to hear that they're playing the more interesting strategy games. Gina: Another big one that I think is tricky when you're first getting started is to be willing to buy used games and this is probably where the bulk of our collection has come from. It can be as simple as go to a yard sale or a thrift store or consignment store. Yes, you are a little bit gambling that the pieces might not all be there and that does happen to us once in a while but I have to say, this is so old and falling apart, we have this game called Can't Stop that I think it's from the late 60's, this is one of our favorite games. We've had this for probably 20 years. I got this at a yard sale because, really, when you're buying it for a dollar or two it's like, “Hey, let's try it out. What's the worst that'll happen?” You can turn around and sell it. This is another one that we have called Acquire. This is an actual 70's version of this game that I got at a yard sale. You need to think about getting past that and think about buying used games. We've also bought used games from other players, other gamers that we know. You can go to Board Game Geek. They have a very busy selling area there and you can go to eBay, Craigslist, and that kind of thing. One of the ways that I actually recoup some of the money that we've put back into our collection is by reselling games that we've decided we don't want anymore. Now that it's been about 25 years collecting games we've gone through once and a while and got rid of some. Just two weekends ago my twins club had a big kids consignment sale and everybody was saying, “Are you gonna bring games? Are you gonna bring games?” ‘Cause they love the stuff that I bring and they know that we've played the heck out of it and we loved it and I even have some reviews of some of these games on my website. So they're looking for those things and I went ahead and sold off everything that my kids had outgrown now that they're older where everything is 12 and up or whatever so we're just keeping those. But, as long as you keep your games in good condition and, especially the nice German games that come with the meeples and wooden pieces, they can last a very long time and those can go from family to family. Either handed down or you can resell them. You can get your costs back on some of these things and then go ahead and turn that back into your collection. Darcy: How often would you say that you go through to look at the stuff that you guys aren't playing as much anymore and resell? Gina: At least once a year. It's something that I've trained my whole family to do before the holiday season because the holiday season is when we get a bunch of new games for the year. My birthday is the week after Christmas and my husband's is right after that so we often kind of go through our collection, get rid of some things and then kind of say, “Hey here's a little wish list” that we give to friends and family and each other and that's typically the time of year we get new games and that's kind of what we play for the next year. At this point, we've been in this house for about 10 years now, when we moved here we had to really cut down on the number of games that could fit. We have two full game closets and then the leftovers are sort of in the living room, which I'm not happy about but my husband loves it. I did just make quite a bit of space getting rid of the kid level games so of course he's very excited to get new things to fill in the spots. But we're also, we're very loyal to certain games. We've been playing some of the same ones since the holidays last year. Like they're still our favorites. They're still going strong. And then every once and a while we'll go back and pick out an old favorite or someone's visiting and they really like a game, we'll pull that out. Darcy: These are really great tips. One of the things that we did where we picked up a few games was we went to a local gaming convention and one of the stores that was there had a whole section of scratch and dents. So it was like buy one get two free. I could not believe it. Gina: That's happened at our local game stores. They'll go ahead and sell off the ones that people have been playing and it's like a rental car, it's barely been played. It's probably in perfect condition. I've even had luck over the years reselling some games on eBay which sometimes they can go for quite a bit. Sometimes even more than you paid for them, which is funny. If things are out of print and that kind of thing. So it's a good idea I think at least once a year to do that and just see where you're at. you can fit on the shelf. I feel like it's a good lesson as they're growing up in their room and then in our living room or in our basement this is how many items this shelf can hold. In this case, in their room it's books and in this case it's games. Then if we're going get five or six new games for the holidays we've gotta make room. So how do we do that and what are we getting rid of? I feel like it's just a good, that they're not learning that you just keep buying more and more and more. That you're actually using the things that you're buying. We talk about value and that kind of thing. That's one of the reasons I actually recommend board gaming as a pretty frugal hobby. There's definitely ways to spend a lot of money like there is on anything but you don't have to. It's actually something you can, there are lots of ways that you can spend less and still really enjoy this as a hobby. Darcy: And I think that's a really good point that the sticker shock can be a little much sometimes, but when you really break it down to are you playing this weekly, monthly? Are you playing it a lot? game might cost more but you're just gonna get a lot of use out of it. Gina: And again, once you form that community of other gamers there are just so many opportunities to share with other people. We see friends over once a month, they have a game night, and we'll just go up and they'll borrow a few for a month and we'll borrow a few for a month. You get that one out of your system and then you take it back and it's like a little lending library between friends. access to a lot more games. Darcy: That's definitely a good suggestion. What if a Board Game is Missing Pieces? Darcy: You were talking before with getting used games, how do you deal with if there are pieces missing? Do you have any tips on that? Gina: The nice thing about the internet is you can look up what's in every single box. You can go to Board Game Geek, which we do often when we get a new-used game, they'll have a picture of all the cards, all the pieces so you know specifically what's missing. Often times if I'm at, really, a yard sale I'll just open it and take a look and you can obviously use your phone and see if there's anything missing. We tend to have, I'm sure you do to, random dice in our house and playing pieces and things like that so we've never had a problem with just adding extra pieces to something. I know when we got this one I think, this doesn't have all the pieces, it never has and yet it's been one of our favorite games forever. So it's fine, you just, you make it work. I don't think we've ever had a really big dud where we bought something and it was missing a ton of pieces. And certainly when you buy things used on Board Game Geek or eBay, people have to be very truthful about it, if you have a problem with them or if anything is missing and that kind of thing. And again, we're teaching our kids to take really good care of these things because they are valuable to us and it is one of the main reasons that I'm able to get so much money back when I turn around and sell them. actually had to do this yet, but I know that there's a lot of companies that you can reach out to about the pieces whether you have to, sometimes you have to pay for it. They're not necessarily just going to send it for free, but it's still, if you're getting the game for only a couple of bucks and then you only have to pay a couple bucks to fill in some pieces, it's still cheaper than the full retail price. Gina: Yes, exactly. And most game companies have really good customer service. You can follow a lot of them on Facebook and Twitter and they're just fun to chat with. Gina: Yes, exactly. You definitely have those every once in a while and people love having the one that's different. Yeah you get used to that, too. Gina: Exactly. We have a, do you have Agricola? That's one of our favorites. We have a whole set of Simpsons figurines that we use when we play Agricola instead of the meeples that it came with. If you can make anything the way you want it to, personalize it. Darcy: Excellent. Let's see, there's some comments like, “Great idea.” And things that people were enjoying that you were sharing. Drop your question in the comments so that we can help you save money on your board game collection. Gina: So then you can have more games. Gina: Or more money for other things that are also important in your life. Gina: The last thing that I was gonna say is to treat, if you're really into this, if this is a hobby, treat it as such. For us we put that budget into the entertainment line of our family budget that we do every month, and every year. Gina: So we don't accidentally spend hundreds of dollars on games 'cause when you're collecting that's kind of what can happen. Darcy: (joking) I've never done that. Gina: It's something we do as a family. It's something that we do maybe instead of going out and spending a lot of money at the movie theater. So other families have other things. We don't pay for cable TV, we do a lot of board gaming so that's where our entertainment dollars go. It's taken seriously and then we do spend a decent amount of money on it. So just keep that in mind. Darcy: – Oh you said before that you were going to talk a little bit about how often you guys purchase games. Gina: I would say the big one for us is around the holidays because we have the holidays then our two birthdays. So we tend to make a list around November 1st of what's new and what we're in the mood for by looking at Board Game Geek and getting reviews and talking to other people. And then, honestly, if our friends already have it we cross it off the list. Because unless we're both gonna wanna play it at the same time, that doesn't usually happen. So that is sort of a thing with us in the past years is to check with this other family that we game with all the time so we don't have duplicates of anything and they do it with us, too. Then we set up a big wish list and then our friends and family tend to buy off of that for the holidays for us, which is nice. For like my husband's birthdays, we always get him board games. That's just, we tend to buy the ones that I don't necessarily want to play. They're like special for him. Things that some of the kids still play with him or he can play with the gaming group. I think we used to do it just all the time when we weren't paying attention to our budget and over the past years, I'd say, now that we treat it as a family hobby, it's really more of a special occasion thing. It's a birthday, Christmas type of thing and we do play the heck out of our games, we really do. Our big favorite from last holiday was Terraforming Mars that we have played, I can't even tell you how many times we've played that game. We just got an expansion and we will pick up little extra things here and there. One of the guys in our gaming group just made these little holders for all the millions of pieces with his 3-D printer so now we're all excited about playing it again. There's always these little extra things we can do. I think when we feel like we need something mid-year, we'll just trade with somebody or ask around in the neighborhood if someone's got a new one if they like the kinds of games that we like. You don't have to spend money all year. It's just something to, you've gotta keep a little bit of control on when you're doing a collection. Darcy: I like the idea of having the wish list idea or the wish list of the games that you guys are interested in for your friends and family to see because that's one other thing that sometimes I think we might forget about is letting people know what games we would like to have if they're looking for gift ideas. Gina: Yes and we are often asked what our gift suggestions are for all ages and that's something that we give a lot to other people and to other families and we have a running list of what the kids liked at certain ages and then again when I've done the reviews on my website it's obviously 'cause we're really into that game. It's a series called Favorite Family Games for a reason. When people say, “Hey, so and so's birthday's coming up and she's nine, what do you recommend?” We kind of know. My husband's co-workers ask him all the time for recommendations for games around the holidays. It's fun to be able to kind of look back at the kids being younger and recommend certain games for different ages. What are we gonna play more often and that kind of thing. Now that the kids are older everything that we play is basically adult games and so they're part of this ranking at this point, too. When everybody picks out a game for dad's birthday they like to go through the wish list and read the descriptions and they picture like, “Well which one of these am I gonna get to play? Or which one am I gonna like the most?” And that kind of helps them decide one. Darcy: Yeah I think that's important, too, is thinking about who all is gonna be able to play it 'cause if you're gonna spend the money on a game is it just gonna be once in a while with one of the kids or is it something that all of your kids are gonna enjoy playing? Are you gonna enjoy playing it with your kids? And that kind of stuff, too. And maybe once a year someone will come over and play it. Those are things we've worked on over the years just as collectors and as gamers. types of games they like so right now it's really hard. We haven't played a five person family game in quite a while actually because everybody is into something different. Everybody's willing to do a one-on-one and sometimes you can get two kids in but it's been quite a while since it's been five people. Darcy: Well great, I really appreciate you sharing your tips with us today. Let everyone know where they can find you for all your other savings tips. Gina: So my website is moneywisemoms.com and all my social handles are @moneywisemoms. So you can find me there and if you take a look at my nav bar, I guess, on my website you'll see where the game reviews are and there's a lot of good stuff there for older kids if that's what you've got or if you're looking for holiday presents coming up soon. Darcy: Excellent; thank you so much for joining us today! Subscribe to get family gaming tips, reviews and our latest content by email.